OPW’s Epsilon™ coupling system was designed to prevent chemical spills and reduce fugitive emissions of volatile organic compounds (VOCs), particularly in the process facility and during transfer to and from truck tanks and railroad tank cars. During in-plant chemical transfers, Epsilon™ Chemical Containment System will provide your plant with process flexibility while also improving operator safety and enhancing environmental compliance and reducing overall capital expenditures and operating costs. Featuring an innovative double ball-valve system, Epsilon™ Dry Disconnect Couplings deliver the lowest product loss in the industry. A tactical balance of an unrestricted flow path and double shutoff reliability makes Epsilon™ the safest and most efficient coupling system in the world. Lowest fluid loss, driven by the innovative unique double ball-valve system, ensures the lowest product loss in the industry. Unparalleled safety with multiple interlocks that eliminate unintentional disconnects and chemical releases that could threaten worker safety and the environment. Full flow with unrestricted flow path. No turbulence! Optimal defense against cross-contamination with optional keyed couplings that mechanically lock out and isolate transfer lines. Engineered for easy operation and maintenance with no special tools needed for seal replacements. 316 Stainless or Hastelloy® Construction for critical, aggressive, corrosive fluids. 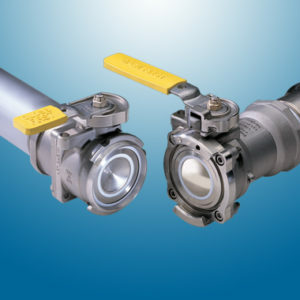 For extremely critical operations, Epsilonoffers the unique keyed interface which locks out and isolates transfer lines, preventing cross-contamination. Detailed step-by-step instructions for the complete disassembly and reassembly of the Epsilon™ coupler. Epsilon comes in stainless steel or Hastelloy® and because of its double ball valve design, Epsilon is a sophisticated low spill coupling system. For the best in-plant chemical transfers, select OPW’s Epsilon™.